At PBK We Specialize in Snowkiting Toronto, Keswick, Lake Simcoe Ontario snowkite skiing and snowboard lessons with the best snowkites you can get! "I've been having a blast snowkiting in strong winds on my snowboard with the Ozone Ignition 3m... nice jumps too...." Jerry B. When I lent them to her there wasn't supposed to be snow for another few weeks. Anyway, I was bummed but I decided to go out anyway, but without skis. Man was it ever windy!!!! We can give you guidelines on how to improve your skills. Select the Image to see the Action! Join PBK for the Rush of Snowkiting! Click below to see more... PBK Official Ozone Dealer... Highest quality snowkites! Sub Zero, Access, Explore and more! Foils are like having 2 kites in one with massive depower...! PBK is available to teach most weekdays and weekends during the season. One Stop Shop! Snow kite lessons in Toronto. Snowkiting in Canada or kite skiing is an outdoor winter sport where people use kite power to glide on snow or ice. Many kiters do this in near Toronto Ontario Canada and USA mostly on Ozone Snowkites. We also offer Snowkiting Lessons in Toronto. The skier uses a kite to give them power over for speed at times and also large jumps for experienced kiters. The sport is similar to water-based kiteboarding, however with the footwear used in snowboarding or skiing. The principles of using the kite is the same, but on different surface. In the early days of snowkiting, foil kites were the most common type. Nowadays many kiteboarders use inflatable kites on the water and sometimes on snow. However, since 2013, newly developed racing foil kites seem to dominate speed races and expedition races, like Red Bull Ragnarok (held on the Norwegian Hardangervidda plateau) and the Vake mini-expedition race (held at Norway's most northern Varanger peninsula). 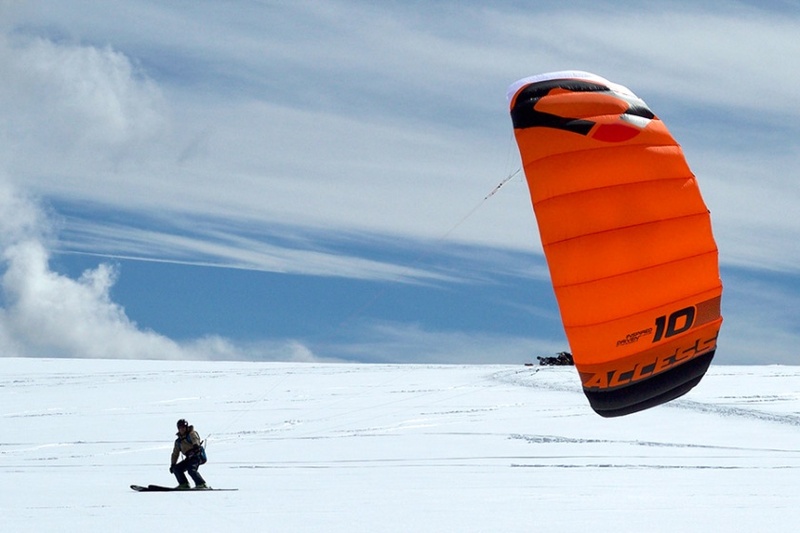 Snowkiting differs from other alpine sports in that it is possible for the snowkiter to travel uphill and downhill with any wind direction. Like kiteboarding, snowkiting can be very hazardous and should be learned and practiced with care. Snowkiting is becoming increasingly popular in places often associated with skiing and snowboarding, right here in Canada and such places as Russia, Iceland, France, Switzerland, Austria, Norway, Sweden and the Northern and Central United States. The sport is becoming more diverse as adventurers use kites to travel great distances and sports enthusiasts push the boundaries of freestyle, big air, speed and back country exploration. Join the fun SNOWKITING or Kite Skiing in Toronto Ontario Canada.